If you happen to have any left over rice, the only real way to salvage it is to fry it. I had brown rice from last nights' meal and a few sorted veggies and a couple of eggs. Amazing, since my refrigerator is generally bare on the weekends. In all of about 10 minutes, we had a lovely lunch of fried rice and arugula salad. (I love that!) Pull whatever veggies you have in the fridge and chop them up and throw into the pan. 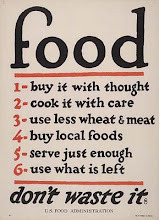 Here is a suggestion of some ingredients to throw in. Heat olive oil in pan on medium heat. Add rice and stir to coat rice with oil. Add any veggies and allow to heat through, about 5 minutes, stirring occasionally to avoid rice from sticking. Crack eggs in a bowl and scramble just enough to combine. Make a well in the pan by pushing rice out of the bottom. 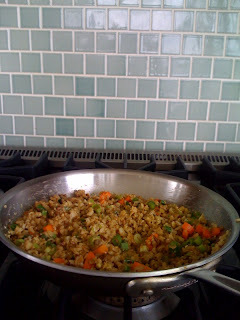 Slowly add eggs and scramble as you incorporate into the rice and veggies. Once egg is cooked, add a dash of shoyu and serve.